On September 13, 1855, a charter was granted to ‘The Rector, Churchwardens, and Vestrymen of S. Clement’s Church in the City of Philadelphia”, and in the following May, the cornerstone of S. Clement’s was laid by The Rt. Rev’d Alonzo Potter, Third Bishop of The Diocese of Pennsylvania. The building itself was designed by famed Philadelphia architect John Notman, whose work includes S. Mark’s Church on Locust Street, the Church of the Holy Trinity on Rittenhouse Square, and, with Napoleon LeBrun, the Cathedral Basilica of SS. Peter and Paul. Although known for its witness to the Catholic faith in the Episcopal Church, the Catholic Revival was not to influence the parish for several decades after its founding, and as such, the building reflects the Romanesque style which was predominantly used for less high-church parishes. The current Clergy House, at 2013 Appletree St., was built in 1903 after the departure of the Cowley Fathers, and was intended to help secure their return to the parish. Additionally, the building was intended to serve a rector and several curates. Currently, the Clergy House serves in a variety of capacities: Quarters for visiting clergy are kept, space is utilized by the Eddie's House program (find out more about Eddie's house here), and the parlor and dining room are used for a variety of purposes, including the weekly Sunday coffee hour. The first floor also houses the Administrative offices of Clementine Montessori. The Clergy House is finished in the Arts and Crafts style, with four carved wooden mantle pieces, and intricate woodwork throughout the house. Notably, the wallpaper in the dining room was designed by John Henry Dearle in 1895 for Compton Hall in Wolverhampton. The original design required two sets of wood blocks to print all 28 colors. This short Romanesque arcade and portal commonly referred to as the "Cowley Porch" was designed by Notman as the entrance to the rear of the Church on Appletree street. Initially at a right angle to the church in the original Notman design, the porch was moved to accommodate various changes over the years, including the addition of a Parish House in the 19th century and the construction of the new Clergy House. The name "Cowley Porch" references the numerous portraits of members of the Society of Saint John the Evangelist, or Cowley Fathers, who ran the parish from 1874 to 1891 in front of the Romanesque arcade. To this day, the porch serves as the primary entrance to the church, and remains a meeting place for parishioners. 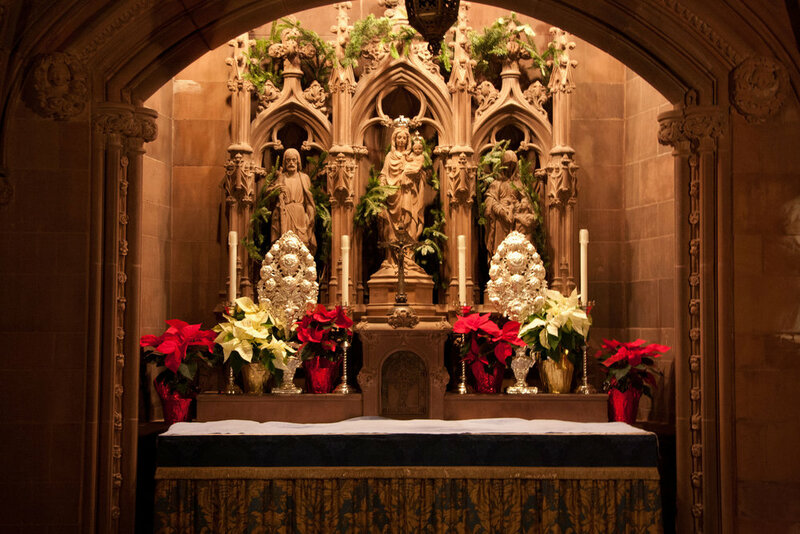 The High Altar, of Gothic design, was consecrated on November 22, 1908, by Bishop Webb of Milwaukee, and is a memorial to Fr. Moffett. It was designed by Horace Wells Sellers, whose design was executed by Edward Maene, a gifted Belgian sculptor. The Altar proper follows the lines of the table-altars of the early Church and is made of English red stone. It is surmounted by an elaborately carved oak triptych reredos, the central panel of which is a large painting of Christ by Frederick Wilson. Wilson depicts Our Lord in priestly vestments, reigning from the Cross, and it should be noted that this portrayal of Christ the King was a new idea when designed by Mr. Sellers, 17 years before the feast of Christ the King was Instituted. Our Lord is surrounded by two Angels holding tapers, as well as the Blessed Virgin Mary and S. John. The current windows reflect the designs of Charles Connick of Boston, who was chosen from several submissions in the late 1930’s. The windows were dedicated on June 21, 1941 by the Rt. Rev’d Spence Burton, SSJE, Lord Bishop of Nassau and The Bahamas. In the upper tiers of the windows on the south side of the nave are symbols commemorating various classes of saints, Angels, Archangels, Martyrs, Confessors, Bishops, Doctors, Virgins, and Abbots, honoring those whose names we do not know, but who number among the saints. The upper tiers of the north side commemorate the twelve apostles. The middle series in the window commemorations of both sides is made up of holy men and women who appear in the universal kalendar of the Church, but whose life and work is connected to the British Isles. The lower series on both sides commemorate saints of the Universal Church during the first eight centuries. Of particular interest are the last six shields of the middle series on the north side, the only changes from Fr. Moffett’s original list of saints. Here several persons closely connected to the Catholic Revival, including Keble, Pusey, Mother Harriet, C.S.M., Fr. Benson, Cardinal Mercier of Malines and Lord Halifax are commemorated. The George Lea Memorial Pulpit and Canopy were also carved by Edward Maene from designs by Horace Wells Sellers. It was blessed by the famous Bishop Manning of New York on the Sunday in the Octave of S. Clement in 1921. A few years later, Mr. Lea’s children donated the canopy in memory of their mother. The sculpted figures on the pulpit’s sides include S. George, S. Clement, S. Paul, and S. Denys, patron of the Lea family. 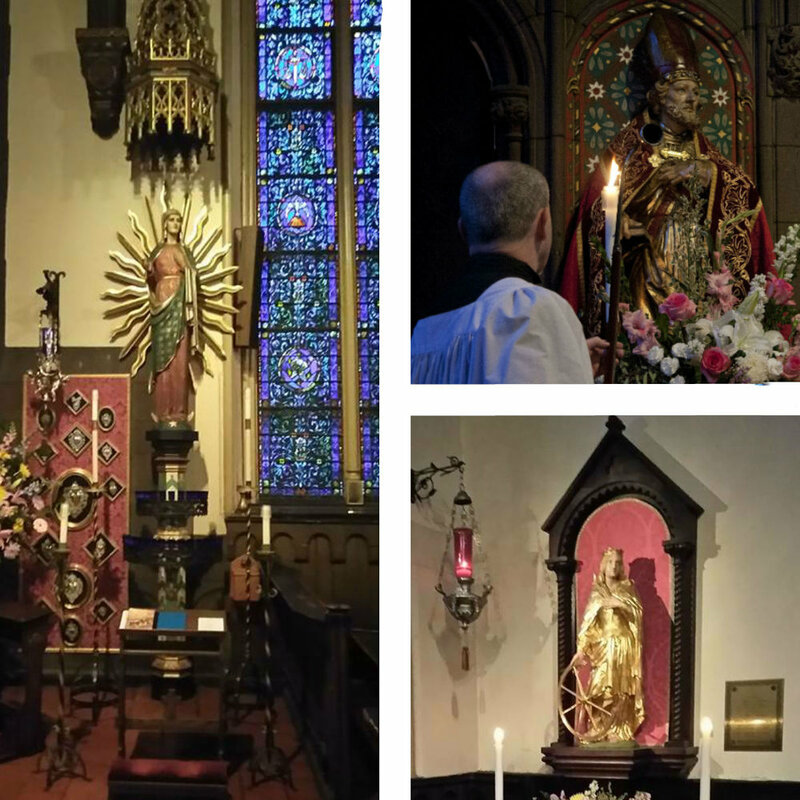 Currently, three shrines can be found in S. Clements Church, those of S. Catherine, S. Clement, and Our Lady of Clemency. The Shrine of S. Clement, found at the head of the north aisle, consists of a wood gilt Italian statue given to the parish by Fr. Joiner on the occasion of his silver jubilee in the Priesthood in 1943. Originally of S. Nicholas, the statue was modified to include a boat, symbolizing S. Clement, by the Robert Robbins Studio. Directly across the church stands the shrine of Our Lady of Clemency, erected in 1943, the statue depicts Our Lady “clothed with the sun, the moon under her feet, and on her head a crown of twelve stars” (Rev 12:1). More information about the shrine can be found here. Lastly, the shrine of S. Catherine, the newest shrine in the church, stands at the foot of the south aisle. Installed in 2006 in the former location of an altar dedicated in her honor, the shrine was dedicated in memory of the late Fr. Laister, sometime Rector, and consists of a fine late 17th century Italian statue of S. Catherine, and restored Notman woodwork. The Lady Chapel designed by Sellers and executed by Maene, is of the same English red stone as the High Altar, and is housed under a beautiful groined ceiling, covered in carved lilies and roses, with a central boss with an image of the nativity. The reredos is formed of three canopied niches containing statues of S. Joseph, and S. Elizabeth with a young S. John the Baptist, with the Virgin and Child occupying the central niche. The tabernacle door is of wrought iron and copper, and shows various symbols of Our Lady: the Tower of David and the Ark of the Covenant. The window was designed and executed by Alfred Godwin, after a 15th century painting by Gozzoli. Our Lady is represented enthroned, holding the Divine Infant, while Angels hover overhead and a jewelled crown descends upon the head of the Virgin. On her right kneel the parish patrons, SS. Clement and Catherine, while on the left are S. Elizabeth and John the Baptist. The inscription is from Isaiah: “Eris corona gloriae in manu Domini et diadema regni in manu Dei tui.” [Thou shalt be a crown of glory in the hand of the Lord and a royal diadem in the hand of thy God.] Wrought iron gates st the entrance to the chapel (as well as the entrance to the choir and between the choir and chapel) are the work of Yellin Studios of Philadelphia. Located at the foot of the north aisle stands the present font of english red stone and gilt wood, executed by Mr. Maene from designs by Mr. Sellers, which was blessed on September 20, 1917. A font was originally at the foot of the south aisle, but was moved upon the completion of the current lady chapel. The current S. John’s Chapel is the result of two major renovations in 1954 and in 1978. 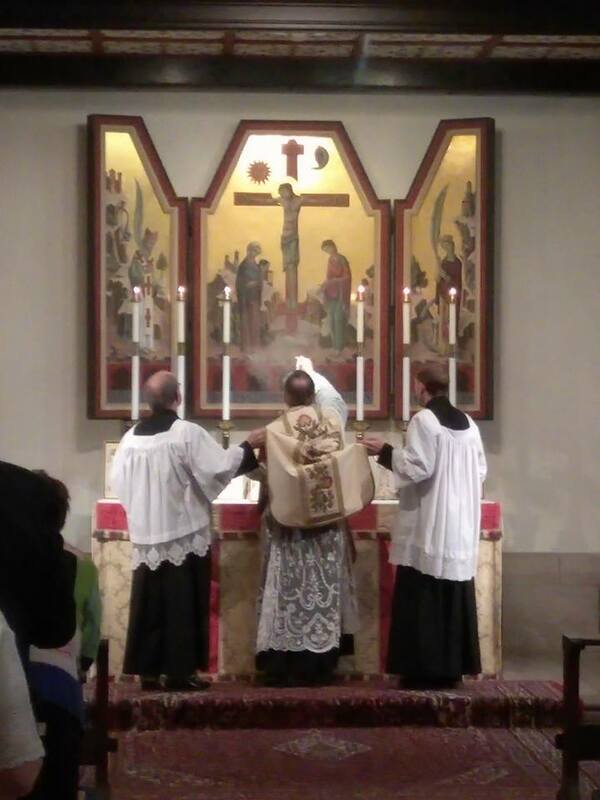 It was in 1978 that the old oak reredos was removed, and the current triptych, a gilt wood piece by Mr. d’Ambly, a renowned liturgical artist based here in Philadelphia, in the Italo-Byzantine style, characteristic of the transition between the medieval and renaissance periods, was installed, . The central panel depicts the Crucifixion of Our Lord, surrounded by the Blessed Virgin and S. John, while on either side the scene is flanked by S. Catherine and S. Clement, surrounded by their familiar attributes, the Wheel and the Anchor. At the bottom is the inscription, ”Dulce lignum dulce clavo dulce pondus sustinens” [sweetest wood and sweetest iron! Sweetest Weight is hung on thee], from Fulgentius’ hymn “Pange, Lingua, Gloriosi”, found in the propers of the mass on the Feast of the Exultation of the Holy Cross. Essential to the work at S. Clement’s are the three functioning sacristies which support the liturgical work of the Church. The “front sacristy” is located underneath the bell tower, mirroring the location of the Lady Chapel on the north side of the church. The front sacristy contains an Altar of S. Joseph, many of the essential materials necessary for Solemn Mass and other services , and houses a number of reliquaries, including a relic of the True Cross. Adorning the north wall is a rood beam from the Sisters of the Holy Nativity Convent, formerly on Woodstock Street, as well as storage for mass vestments and a vesting area for the sacred ministers. In the center of the room, hanging from the ceiling, is a large multi-tiered Georgian chandelier with candles. It is a custom of the parish that this chandelier is lighted only on Christmas Eve while the Servers and Sacred Ministers are preparing for the Midnight Mass. The “back sacristies”, located next to the S. John’s Chapel, allow for mass to be celebrated in the chapel and house a number of vestments and other items. S. Clement's is blessed to have beautiful gardens along the southern side of the building, home to various trees and flowering plants. 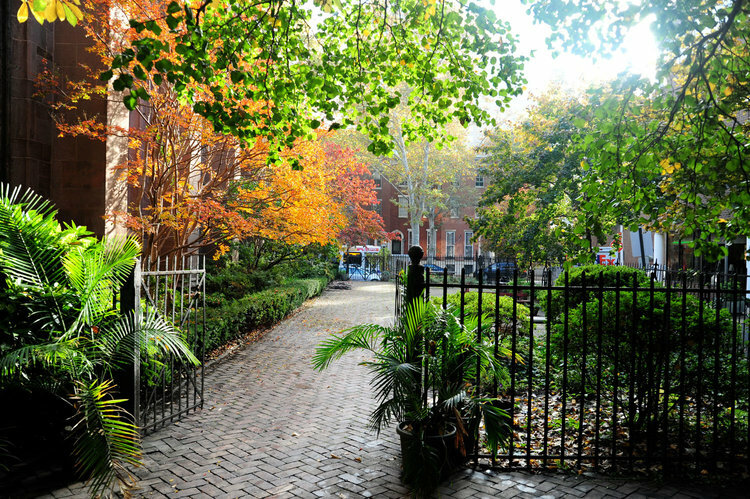 A paved brick path crosses the garden to the exit on 20th street, opening up on an area with benches and a table where visitors can sit and enjoy the garden seven days a week. While most of the garden is managed by dedicated Volunteers from S. Clements, an area of the garden is maintained by the students and faculty of the Clementine Montessori School. The Garden plays host to a variety of parish functions throughout the year, from summertime Garden Coffee Hours to Carol Sings in the winter, as well as events for Eddie's House and Choral Arts. The Garden is the recipient of several awards from the Pennsylvania Horticultural Society .